To mark the centenary of World War One, we created an original piece of theatre, exploring the lives and points of view of those that protested against the conflict. Funded by the Heritage Lottery, the piece included a new play, A Dangerous Woman (shortlisted for The Adrian Pagan new Writing Award) and a specially devised movement piece, inspired by the words of war-objectors. 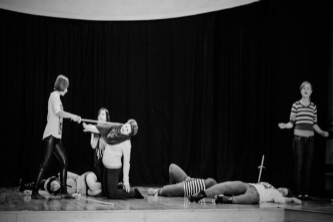 The production toured venues around the south west, receiving ecstatic audience and critical responses. Discussions were held after the performances, at which audience-members were invited to share their reflections on the piece. To listen to an edited selection of those conversations and see photographs from the production, please follow the links below. We have creative partnerships with a number of theatre companies across Europe. 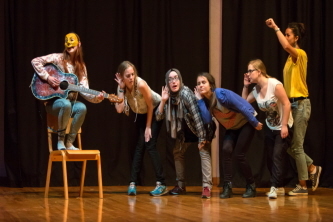 We regularly run theatre-based training courses in the UK, Georgia and Albania - funded by the EU Erasmus + programme and attended by young people from all over the continent. These are precious experiences, through which we build a real sense of social cohesion and artistic togetherness - learning and sharing from all our different theatre traditions. Participants on these courses have described them as: "more useful to me than three years at drama school", "very powerful and helpful, I received more than I thought possible". We believe that the European project is an important one, to which transnational theatre collaborations can make an important contribution. In Sept 2017, we will launch The International Shakespeare Project with a production of King Lear, staged in partnership with Ch-erete (Greece) and The House of Puglu (Lithuania). A regional company with international reach. We began with family theatre. Resident at The Picturedrome on Barton Street, we created large-scale adaptations of classic children’s stories, using live music, puppetry and dance. Alongside these professional shows, we developed a thriving-in-the-community scheme, including a particularly popular young company. Some of our young actors were so good, we decided to put them in our professional shows – providing them with on-the-job training. We realized that, in doing this, we were effectively rediscovering the principles of regional, repertory theatre. This became our goal as a company: to work constantly on productions with casts that include both experienced professionals and young actors, learning their craft. In recognition of this work, we have received large-scale funding from The Arts Council, The Sainsbury’s Trust, The BBC, The British Council, Gloucester Council and the Erasmus + and Youth in Action programmes of the EU. Over the years, we have developed a working relationship with a number of theatre companies around Europe, in partnership with whom we deliver actor-training courses. These courses run throughout the year and have been attended by actors from practically every country in Europe. We are currently building an pan-European ensemble with the goal of launching The International Shakespeare Project. We are also launching ourselves as a touring company, due to tour our first piece, A Dangerous Woman, in 2018. Want to discus your ideas for a new project or just want to say hi? It's all good, we'd love to connect with you. Just fill out the form aside or contact us via the details below.